Makita's Interlocking Modular Tool Cases are the latest innovation in power tool storage and transportation. Created as a solution to efficiently organize and transport and ever increasing stable of power tools, these cases feature a modular interior that allow for storage of a variety of tools. 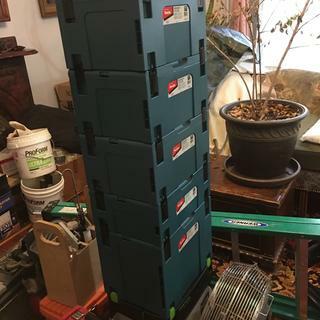 And, as the title states, these cases are interlocking with not only Makita modular cases but other name brand stackable cases as well such as the Festool Systainer systems and SP6000J/J1 system. Festool and Systainer are registered trademarks of TTS Tooltechnicsystems AG & Co. KG. I love the foot print of these bins. I would recommend these for anyone trying to organize lots of tools. They are priced well, and they compatible with Festool bins. I own several brands of modular bins, I prefer Makita for our nicer tools that I don't want crammed in with other tools in the big bins. Small size leads to less clutter. We have tried many different types of storage. Plastic boxes, wooden boxes. The Rigid and DeWalt system. But when these are full of tools they are very heavy and one risks banging into the customers walls and trim. The Makita sustainers are light and well balanced. Each tool box hooks together and they do not fall over or slide off of one another. They are light because they limit the amount of tools. This system helps you organize the tools you have and when stacked they take up a small amount of space. I would like to see Makita offer a cart to move them around on the job site and continue to offer more options in this line. All stacked up with our tools. nice product i own the extra large one this is great for my trim saw. I bought the box for additional storage for my Makita tools and that it can be used with the Festool boxes. Rated it a 4 only because the latches are a bit tight to latch and un-latch. My first impressions were these cases are flimsy. However, it has survived two weeks of being banged around and shows no signs of wear. The lid still closes precisely as when I bought it. I do like the uniformity of appearance that comes with my tools stored in a stack of these modular cases. As much as I hate to admit, a good first impression can put to rest any doubt a client has about my workmanship. Showing up sloppy and disorganized only encourages nitpicking and complaining. Personally, I like the DeWalt Tstak boxes better but the Makita has a cleaner, symmetrical appearance that impresses customers more. Not sure why but they do. I bought this to store my Makita tools. The box is very nice but, the latch is plastic and kind of hard to lock in. I hope the latch will last. I have a small amount of space and since these boxes are stackable it helps me fit more into that space.cpo's price was the best and they had a lot of them to choose from.i would recommend getting the foam inserts with them. Love these for easy storage and transport of tools. I had just replaced all of my battery operated tools with Makita tools. The cloth bag on wheels was nice but not acceptable. There was nothing protecting the tools but a piece of cloth. These new tool boxes are perfect! They are so nice, I purchased 4 of them. The XL works great for saws and bigger things, the medium for drills, and the Large for everything else. Now all my Makita tools are protected and easy to lift or I can clip them together easily and move them with a dolly. Storage space is also great since they stack and will not slide off each other. I may get more for my other tools.